Just a couple of weeks ago my sister and I were online together and talking about Baby Shoes. My sister sometimes rivals The Shoe Blogger for her love of shoes and all of her daughters are developing the same trait and we thought that Chicken (her newest baby) would be no different. Just a couple of days later and I was offered some Baby shoes from The Baby Shoe Company to review and as my Sister loves shoes and I had some plans about ditching the Nappy Cake I thought that some of the Leather Cuteez shoes would be just the thing to welcome the new baby. This weekend we finally got our chance to go and visit with my Sister and her family and to meet Chicken, who was born last Wednesday evening. Everyone loved the various gifts I had for the family (My sister love her "Wine", her partner loved his "Pint" and the eldest three Cousins loved the personalised mugs I *made* for them) and my sister adored the shoes that had been sent for us to review. They are the smallest size made for Babies between 0 and 6 months and so next to Chicken look enormous but are oh so sweet! My sister loved that they were only £8.99 and were made with a Suede sole and leather uppers. 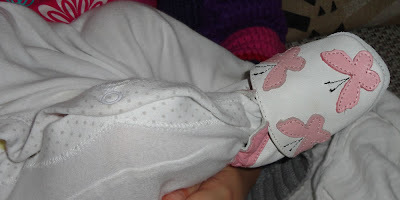 Soft Flexible Leather shoes are good for babies feet as whilst keeping them warm they also allow the feet to "breathe". I loved that they come in a lot of different styles so I can help Chicken to have more shoes than Imelda Marcos. We were send two pairs of Cuteez Baby Shoes from The Baby Shoe Company.